Description: This charming hotel enjoys a great location, lying just 100 metres from the beach of Rethymno and a mere 200 metres from the Old Town district. Guests will find themselves in the ideal setting from which to explore the delights that this captivating city has to offer. 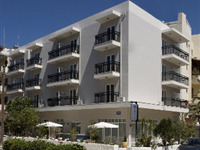 The hotel is located within easy access of the main attractions of the area. This delightful hotel greets guests with warm hospitality and charm. The guest rooms are tastefully decorated, and come complete with modern amenities for added comfort and convenience. Guests will be impressed by the facilities that this hotel has to offer. Guests are invited to enjoy a delightful breakfast each morning, served in a buffet-style.